← A room with a view! Bulicame Hotsprings – mentioned by Dante, visited by princes and popes. 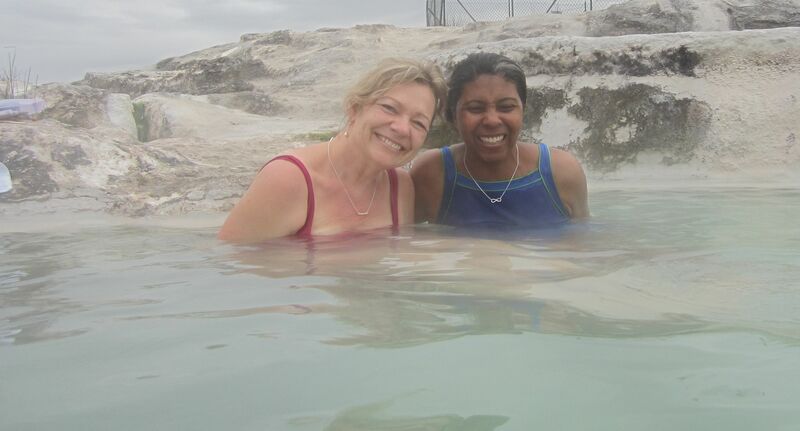 People have been soaking in these natural hot springs for thousands of years. I love these healing waters! We took some time from visiting gardens and doing art meditation to visit Bulicame. People have soaked in these natural hot springs for thousands of years. Dante mentions the hot springs in his writing. Popes and princes have come here to heal and enjoy the waters. There is a strong sulfur smell and the rocks are coated with white minerals from the waters that gush from the top of a knoll and run down into several pools in the center of a grassy field. The top pools are too hot and gradually the water cools as it flows in the lower pools. The trick is finding the correct pool temperature, for the day you visit. We visited Bulicame on an overcast day with some sprinkles of rain. The dash from the car in our bathing suits and bathrobes was invigorating and the heat in the water felt amazing. We quickly made friends with a couple who had driven up from Rome just for a day at the hot springs. A perfect afternoon!